Satwik Mehta manages the Virtual Engineering team at HSSMI. He has extensive experience in manufacturing predominantly in the automotive sector. After graduating from the University of Pune in Mechanical Engineering, he worked for the Volkswagen Group on multidimensional facets of planning new products and processes. 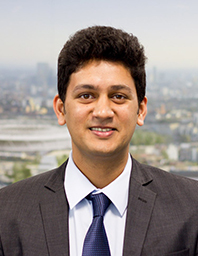 Satwik has also acquired an MSc in Manufacturing Engineering from the University of Warwick where he developed a framework for operations sustainability. Satwik oversees delivery of research and commercial programs for the Virtual engineering team at HSSMI. He is also leading an Industrial working group for developing design and installation guidelines for collaborative robots.